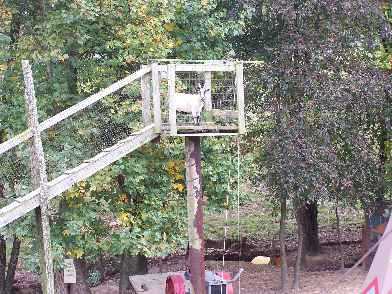 Great family entertainment for a low price and PYO apples! Phone: 706-273-3838. Alternate Phone: 706-273-9494. Fax: 706-273-3888. Email: [email protected]. 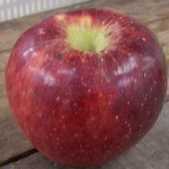 Open: PYO apples are available on certain weekends in September and October. Pick your own apples 2018 is September 8th - October 28th on Saturdays and Sundays ONLY. Directions: Exit onto Highway 52 East. 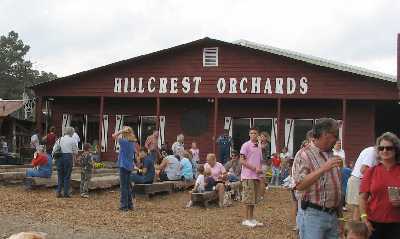 Hillcrest Orchards is 9 miles east of Ellijay on Highway 52. Alternate route: Highway 400 North to Highway 53 toward Dawsonville, just past the Outlet Mall, go through Dawsonville, about 2 miles outside Dawsonville turn right onto Highway183, go about 10 miles, turn left onto Highway 52 West, Hillcrest if about 12 miles on left. Click here for a map and directions. 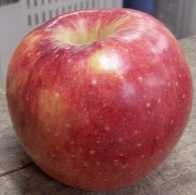 Produce: Apples, pies, doughnuts, ice cream, honey, crafts, bread, dried apples. 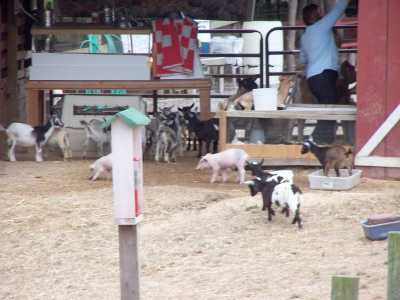 Petting farm. PYO only during the Apple Pickin Jubilee festival - call for the current dates and times! September and October weekends, 9:00 am to 6:00 pm. 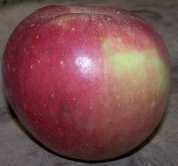 You pick apples available on specified weekends only. Apple Pickin' Jubilee" begins early September and continues each Saturday and Sunday until the last weekend in October; Business hours are 9:00 until 6:00 daily. Payment: Cash, Debit cards, Visa/MasterCard. 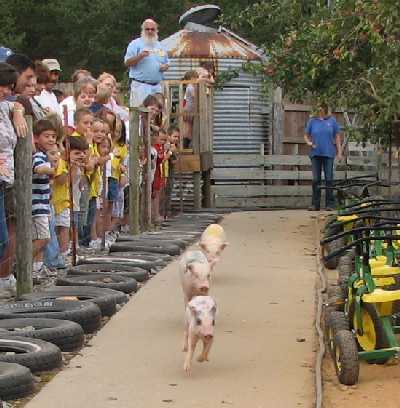 Festival activities include wagon rides, live entertainment such as Country Bands, Cloggers and Pig Races. 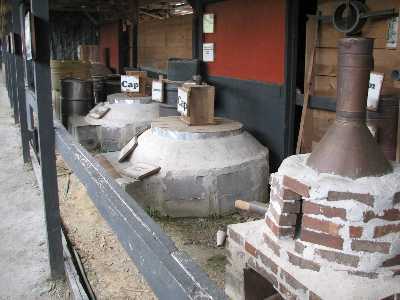 You can milk a real live cow, ride pedal carts, visit the Moonshine Museum, Farmhouse Museum and Enchanted Forest Walk. We offer Pony Rides and Bull Rides. Lots of great food such as homemade fried apple pies, apple fritters, apple cider doughnuts, ice cream and fudge. Visit the grill for burgers, dogs, BBQ, and more. 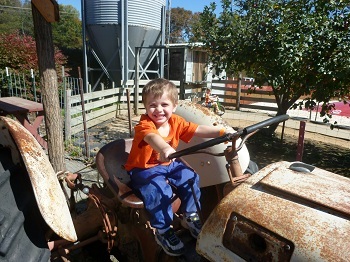 There are several tractors the kids can climb on. Great photo opportunities. Bluegrass bands and clogging groups perform each afternoon at the "Apple Pickin' Jubilee". Food is available outside in the food court or inside the ice cream parlor. 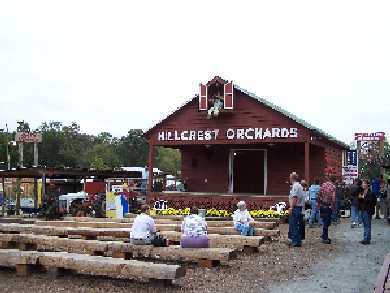 Pick your fun at the annual "Apple Pickin' Jubilee" where you can pick your own apples, milk a cow, watch live pig races, visit the petting farm, take a wagon ride through the orchard, visit the Moonshine Museum and watch live bands and cloggers on the Hillcrest Stage. Visit our playground and ride our giant slide down the mountain. Come hungry because there's more food than you can hold. Visit our bakery and ice cream parlor for homemade fried apple pies, apple cider doughnuts, apple fritters, pizza, ice cream, fried oreos, funnel cakes and fudge. Wash it all down with some fresh cold apple cider. We'll have the grill fired up outside in the festival area for hamburgers, hotdogs and barbecue and roasted corn. Be sure to try the chicken on a stick and grilled corn on the cob. 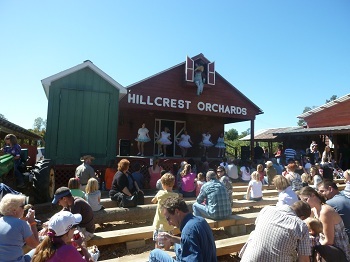 Especially during their Apple Pickin' Jubilee weekends, is much more than an orchard or roadside stand, Hillcrest is an afternoon of family entertainment. Starting inside with the shop, you can watch north Georgia's famous fried apple pies being made and find all kinds of treats, like apple bread! milk a cow (event the children my try milking), often musical entertainment on their stage, haunted house and more. 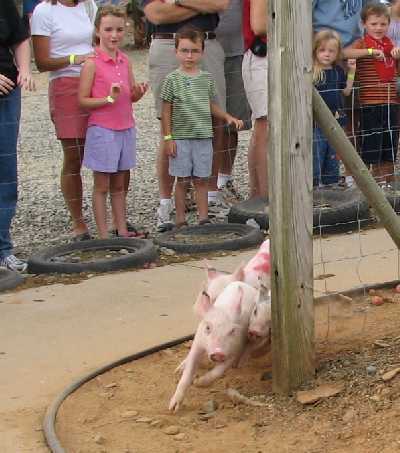 Heck, it's worth the visit if only for the pig races! Everyone quickly gathers way they announce the next races! Place your bets and possibly win a prize, or lose your bacon! 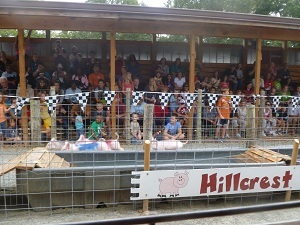 The new pig racing stadium has covered bleachers on both sides for a clear view and protection from sun or rain! 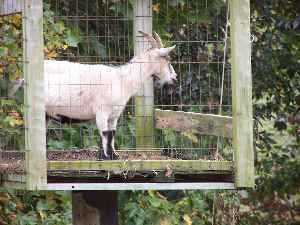 The folks are friendly, the apple trees are low and easy to pick from, and there is so much to do, this is my pick for the orchard to go to for a day of family fun and entertainment! The only weak spot is the portapotties! Go before you come! click here for the current dates and times of the apple picking and pricing. 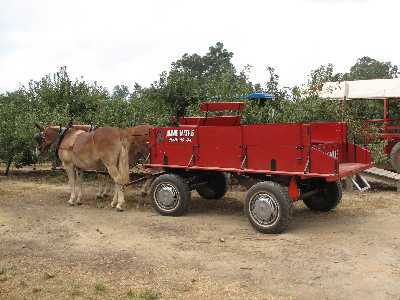 Pick your own apples, wagon rides, playground, pig races, moonshine museum, en tertainment, food, corn maze, petting farm and pony rides. 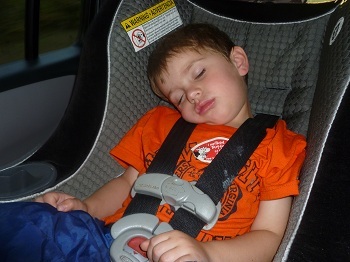 After a day at the orchard, the kids fall asleep as soon as they get in the car! Comment from Blake: I've been to this farm many times, including 2 weeks before the commenter above and again on October 16th. Yes, the mannequin displays are rustic, but my kids (2 and 5) really liked them. And yes, Ellijay is in the north Georgia mountains, so if you are looking for Disneyland-quality animatronics, you'll be disappointed. Heck, you're going there to pick some apples, ride a wagon, listen to folk music, and watch pig races. Where else can you and your children actually milk a cow and hold a baby chick? This isn't an evening at the opera in Vienna. The displays are whimsical and comical in their simplicity, so the kids have fun. It can get crowded on some weekends, but that's more of a testament to the popularity of the place.